Keyes, J. Gregory. 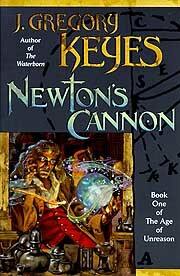 Newton's Cannon . Ballantine/Del Rey 1998. What if: Isaac Newton turned to the study of alchemy and discovered "philosopher's mercury". 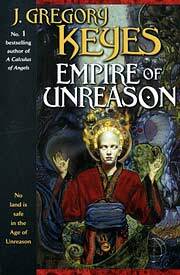 Series note: Series plus an intersticial story, including Newton's Cannon , "An Air of Deception", A Calculus of Angels , Empire of Unreason . and The Shadows of God . 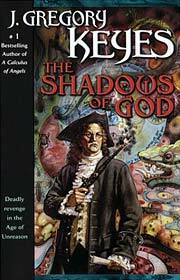 Awards: Finalist: 2001 Sidewise Award for best long-form alternate history. Summary: In 1720, England and France are at war, and the French begin work on a weapon of mass destruction to repel the invaders. Meanwhile, in Boston, the teen-age Ben Franklin applies the principles of "science" to help his brother's printing business, but finds himself involved in events much larger than he could have imagined. Series note: Volume one of the Age of Unreason series. Published: Ballantine/Del Rey 1998 (0345406052BUY), 1999 (0345433785BUY). Translation: French by Olivier Delpari as Les démons du Roi-Soleil , Flammarion/Imagine 2001 (2080679619). Keyes, J. Gregory. "An Air of Deception"
Summary: Arrivsing in Prague, Benjamin Franklin tries to duplicate Newton's aegis in order to win the affections of two noblewomen. Series note: Intersticial story in the Age of Unreason series, fitting between the first and second novels. Published: In Amazing Stories Spring 1999. Translation: French by Christophe Corthouts as "La déception est dans l'air", in Phénix #58 (March 2003) (2846020078). Keyes, J. Gregory. 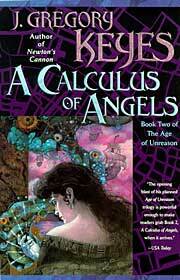 A Calculus of Angels . Ballantine/Del Rey 1999. Summary: Two years after Western Europe has been virtually destroyed, Peter the Great is in the process of subjugating what remains, with only Isaac Newton and Ben Franklin standing in the way. Meanwhile, an expedition from the Americas crosses the Atlantic to discover why the loss of contact with England and France. Eventually, all heats to a boil in Venice. Series note: Second volume of the Age of Unreason series. Published: Ballantine/Del Rey 1999 (0345406079BUY), 2000 (0345406087BUY); SFBC 1999. Translation: French by Olivier Deparis as L'algègbre des Anges , Flammarion/Imagine 2002 (2080681893). Keyes, J. Gregory. Empire of Unreason . Ballantine/Del Rey 2000. Summary: Ten years after Venice, a Stuart king arrives to claim power in an independent America, but concerns arise about who is backing his claims. Meanwhile, in St. Petersburg, plotting and turmoil is afoot due to Tsar Peter's long absence. Series note: Third volume of the Age of Unreason series. Published: Ballantine/Del Rey 2000 (0345406095w88 androidBUY), 2001 (0345406109BUY). Translation: French by Jacques Chambon as L'Empire de la Déraison , Flammarion 2003 (2080682997). Keyes, J. Gregory. The Shadows of God . Ballantine/Del Rey 2001. Summary: The conflict of nations and of humans against malakim comes to a climax in New Paris in the American Southeast. Series note: Fourth and final volume of the Age of Unreason series. Published: Ballantine/Del Rey 2001 (034543904XBUY), 2002 (0345455835BUY). Translation: French by Olivier Deparis as Les Ombres de Dieu , Flammarion 2004 (2080682989).